So here it is the time of year that it’s getting cooler at night with everyone wanting to make the most out of their remaining produce from this season. I think that we’re in order for some very hearty vegetable soups. Here is one of my families favorite ways to enjoy Sweet Potatoes. You can always find them in casseroles or as a baked side, but rarely in a soup. When I first started making this soup, it must’ve been requested at least twice a week (but we’ve cut down on that now…. more like a couple times a month in the fall and winter). Place sweet potato slices and chicken broth in a 3 quart slow cooker. Cover and cook on high for 4 hours or until sweet potatoes are tender. In a blender, puree the sweet potatoes and broth (never filling the blender more than half full at one time) until smooth consistency. Put mixture back into slow cooker and add remaining ingredients. Stir to thoroughly incorporate and cook on high for an additional 2 hours. Can be served with a dollop of sour cream, if desired. **TIP** For an extra spicy kick, add ¼ teaspoon of ground cayenne pepper before cooking the additional 2 hours on high. Now share with all of us your favorite crock pot vegetable soup recipe. There are just a few rules to follow….. The recipe must be a crock pot recipe. Any recipes that are not crock pot recipes will be deleted. The recipe must be a vegetable soup recipe. It doesn’t matter if it’s a corn chowder or a baked potato soup, but any “chicken noodles” or other meaty soups will be deleted. Make sure to check out all the recipes that interest you and leave a comment so the person that submitted that recipe will know you visited them. Link directly to your post, NOT to your homepage. Have FUN! 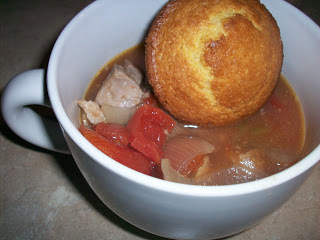 And remember ….. Crock Pots ROCK! Oh…. and next weeks Slow Cooking Saturdays theme is Apple Desserts. So don’t forget to dig out all of those cookbooks or give your granny a call for a long lost crock pot apple dessert recipe so you’ll have something to submit for next weeks recipe swap. This recipe shared at Ultimate Recipe Swap, , Potluck Sunday, Hearth ‘n Soul and Recipe Swap Thursday.